Infinite Regress from the exhibition Black Square 100 Years like all works in that show, was a reinterpretation of Kazimir Malevich’s famous Black Square (1913/1915). 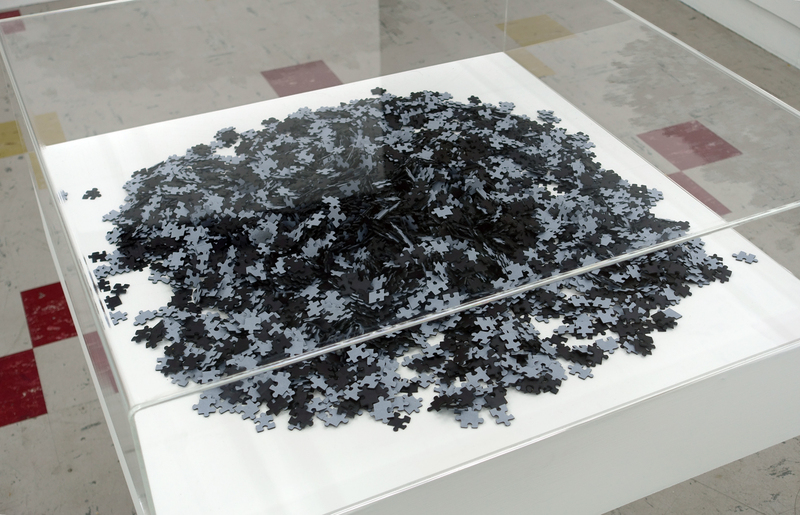 Consisting of several thousand black jigsaw pieces, Infinite Regress posed from the outset the very problem of reconstruction: with no discernible detail evident in any of the jigsaw pieces the puzzle was rendered effectively impossible. With this literal possibility denied, the ‘finished’ work would have to exist entirely imaginatively. However, the original Black Square already suggested a double-edged arguably contradictory problem in attempting to overlay materialist and transcendalist approaches. The Black Square is simultaneously object and infinitude, representation and ‘thing’. 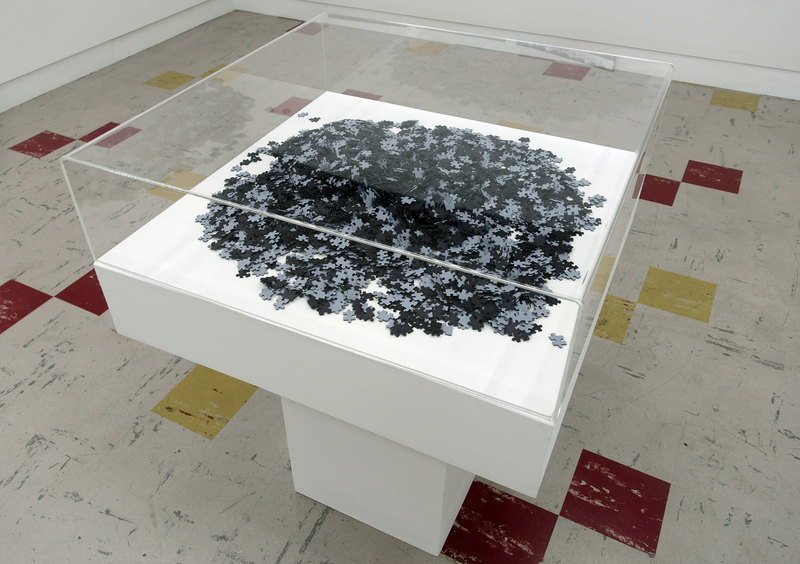 The mass of incompletable, inaccessible jigsaw pieces in this particular work spoke of the atomisation of the Original through time, its eternal incompleteness. It is the Black Square’s ultimate irresolvability that furnishes its continuing interest, its quotient of infinity and persistent virtuality. Black Square – 100 years (1915 – 2015) was the sequel to the first incarnation of this exhibition (curated by myself and Iakovos Amperidis) at the AEAF Adelaide in 2013 (www.blacksquare100.wordpress.com). The exhibition marks the second 100 Year Anniversary of Kazimir Malevich’s seminal modernist work the Black Square. The proposed exhibition a significant extension of the first show and deliberately invokes Malevich’s self-mythologising. With this in mind, central to our conception of this exhibition, as well as the preceding one, was the paradox of the Black Square’s two 100 Year Anniversaries; Malevich claims to have first conceived the Black Square in 1913 as part of his set-designs for the Russian Cubo-Futurist Opera ‘Victory Over the Sun’ in which the Black Square featured as a theatre curtain and backdrop. However, the most famous version of this work (and there are others) is Malevich’s oil painting now in the Hermitage in St Petersburg dated 1915. More broadly, Black Square – 100 years proposed the Black Square as a foundational work of conceptual art that paradoxically merges materialist and transcendentalist tendencies. Thus the Black Square is both iconically imminent and a portal to another dimension. What it resolutely is not is simply an ‘abstract’ painting. It is this paradoxical dimension that makes the Black Square an exceptionally contemporary work, a work whose conceptual interpretability is mutable and endless like language. This exhibition brought together both important existing historical work and brand new interpretations of the Black Square in numerous inventive permutations. All the artists chosen to participate in this exhibition considered the infinite possibilities of the Black Square as a fundamentally conceptual, rather than merely formal, proposition.